I had the Essentials by Ellen Stay Salty set out to work on a different card, and the cute little mermaid tail just had to get inked. I stamped all the images onto an ombre sheet from Amy Tangerine. And then popped a die cut tail (stamped, embossed & colored) over the stamped tail (the stamp has the splash drops, the die does not). Supplies: Stamps – Essentials by Ellen, paper – American Craft Amy Tangerine On A Whim, Neenah Classic Crest Solar White, Stampin’ Up! Bermuda Bay, inks – Copic BG15, Hero Arts Unicorn, Ranger Perfect Medium, VersaFine Deep Lagoon, Smokey Gray, die – Essentials by Ellen, embossing powders – Filigree Fine Arts Powder clear, white, Ranger Silver Pearl. 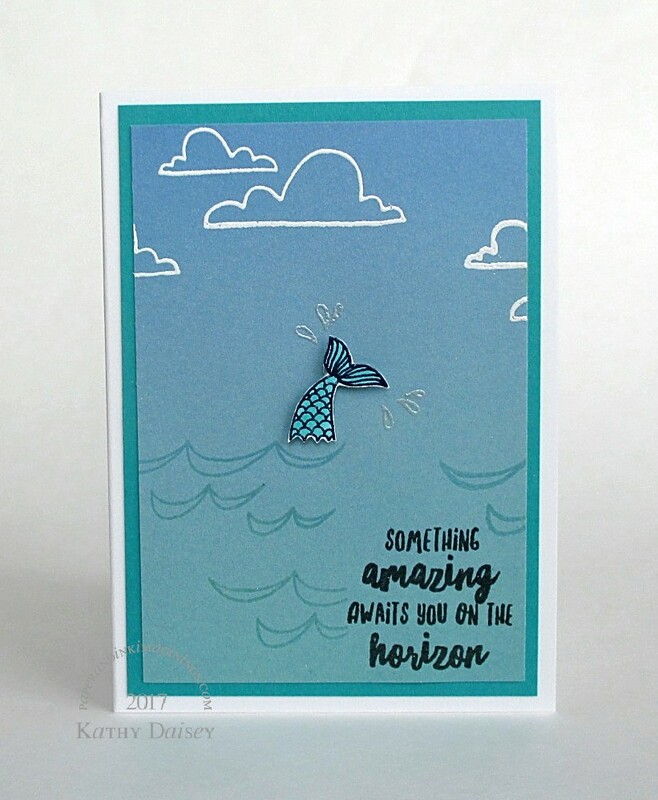 Categories: card, encouragement | Tags: card, Copics, Essentials by Ellen, Hero Arts, Neenah, Ranger, Stampin' Up!, Tsukineko, VersaFine | Permalink. So imaginative, I love it. Thanks so much, Miss Hammie!